Not for lack of exposure, but Iran’s vast domestic military industries have never been sufficiently acknowledged by the countries sworn to curb its ambitions. This is a remarkable lapse since the extent of military-industrial production in the Islamic Republic surpasses its neighbors and is impervious to economic pressure. Although some locally made weapons are of dubious quality, constant investment in anti-aircraft systems to deter a possible air campaign has given Tehran a decisive edge over its foes. With sanctions keeping foreign arms manufacturers from participating in Iranian exhibitions, the publicity surrounding Eghtedar 40 in February served as a rare occasion to measure just how large Iran’s conventional arsenal is. Indeed, when it comes to missile technology, Iran does rival its nemesis Israel. The Russian Buk-M2E is available for export. Via Wikimedia Commons. Eghtedar 40 was meant to serve as a public celebration of the 1979 uprising that overthrew the late Shah Pahlavi. One aspect of the festivities was an arms show for promoting military production in Iran. During a week-long indoor exhibition a set of missiles were displayed with colorful tarpaulins in the background explaining their use. Iranian media are known for faithfully publicizing “military achievements” no matter how ridiculous, yet with the exception of the Hoveizeh cruise missile, few guided munitions were given coverage at Eghtedar 40. One photo (see above) circulated by Iranian media does reveal the extent of reverse engineering as a viable alternative for homegrown R&D. In it, three different models of short to medium-range anti-aircraft missiles are parked side by side. As innocuous as they appear, each of them are successful attempts at copying foreign technology. 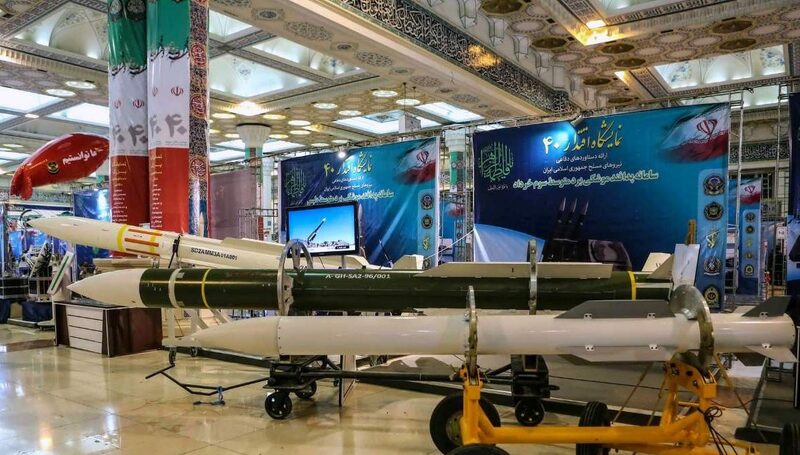 The two missiles at the foreground are from the “Taer” series of SAMs while the large creamy white missile behind them is the Sayyad-2, whose existence is bad news for the same crowd who envision massive aerial warfare against Iran. To further demystify the missiles, the Taer SAMs are faithful copies of the Soviet 9K37 and the 9K37M1 missiles used on the SA-6 Gainful and SA-11 Gadfly SAMs. The Taers are carried by a wheeled launch vehicle called the Raad (pictured below) that resembles the Russian Buk-M2E. Based on figures published by open sources, the Taer-2B missile’s maximum range is 50 kilometers with an altitude of 25 km. On paper, the missiles are suited for anti-ballistic missile interception, but the greatest threat to Iran at the moment are standoff munitions delivered by fourth and fifth-generation multirole fighters. The Iranian Raad armed with Taer missiles. Via Wikimedia Commons. The Sayyad-2 couldn’t be more different from the Taers. Rather than a copy of a Soviet missile, the Sayyad-2 is based on the US Navy’s RIM-66A SAMs that were installed on Iran’s warships during the Shah’s reign. The design was repurposed at least a decade ago and adopted on a road mobile delivery vehicle that carries launch containers similar to the MIM-104 Patriot . The Sayyad-2’s role is defending critical infrastructure from air attacks and, when paired with locally made radars, each battery is able to track targets hundreds of kilometers away. The Sayyad-2 is supposed to complement the Sayyad-3 long-range SAMs carried by the Talash system (a 6×6 truck with a TEL) and together they form a layered anti-access umbrella over a specific location. Since Iran’s air defense forces still operates Chinese and Russian SAMs, the introduction of locally made air defenses must serve as a credible argument against punitive strikes within its borders. The Islamic Republic does see itself under siege by external threats and maintains a wartime manufacturing base whose output puts a lot of other countries to shame. It’s also dangerous to ignore Iranian anti-aircraft missiles, whether MANPADS or larger systems, when these can reach its favorite proxies.